Guwahati: Jamshedpur FC would look to make a winning start in their Indian Super League debut when they take on NorthEast United FC in Guwahati on Saturday. 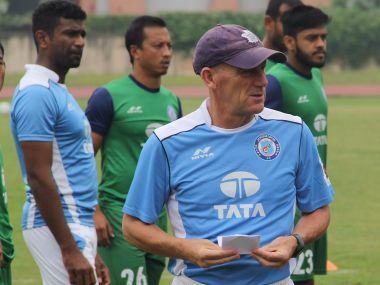 Even though Jamshedpur are new to the ISL, they have enough experience in their ranks, starting with their coach Steve Coppell who guided Kerala Blasters to the final last season. On the field, there will be Jose Luis Espinosa Arroyo in defence, South African Sameehg Doutie in midfield and Senegalese striker Talla N'Diaye. Coppell said his side have prepared well for the league and his players were raring to go. "I am excited about our first match. My squad has been preparing for six to seven weeks. I think we are all raring to go. Looking for the challenge. We are a new franchise but that doesn't make a great deal of difference," said Coppell at the pre-match conference. "Coming here (Guwahati) for the first match of the season is difficult. They have got a good team and we don't know much about them as a team. Once we get few games under our belt, we can prepare better for our oppositions," said Coppell. Caution is the buzzword for NorthEast United FC coach Joao de Deus as his team opens the campaign with a home match at the Indira Gandhi Athletic Stadium on Saturday. NorthEast United have never made it to the playoffs in the last three ISL editions but the Portuguese coach sounded confident that his team can turn over a new leaf as they start with a home game. "I can't speak of the past. At this moment, our team, we have a group of qualified coaches who have deep knowledge of training. But in competition with so much demand, we should be careful in some situation. We are preparing our team in a certain way," said Joao. The hosts have a strong enough squad to challenge the established teams in the competition. India stars Halicharan Narzary and Rowllin Borges will be certain starters in midfield. "First, let's see if he is on the field tomorrow. If he is not available obviously we are not going to play with just 10 players. He'll be in the XI if he is fit," said the coach.